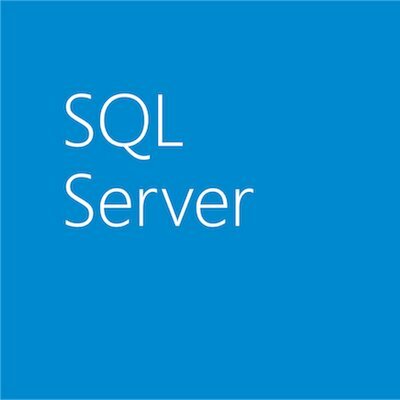 With the upcoming general availability of Windows Server 2016, we are pleased to announce that Microsoft SQL Server 2016 will support deploying databases on the new Storage Spaces Direct feature of Windows Server 2016. Storage Spaces Direct, new in Windows Server 2016, enables customers to create highly scalable and flexible storage solutions, using local storage. The ability to aggregate locally attached storage across the nodes in a failover cluster enables customers to create very large and highly available pools of storage from types of devices which could not be leveraged before, such as inexpensive SATA SSD, or cutting edge solutions like NVMe flash, which must plug directly into the PCIe bus inside the machine. The fastest storage devices currently available do not use any of the traditional storage bus protocols. They plug directly into the PCI-E bus, so that the system can access the data directly with extremely low latency, or even faster than that are solutions based on nonvolatile RAM sitting in DIMM slots. At this point, the capacity of the devices is modest, making the ability to aggregate them across many nodes extremely attractive. By aggregating locally attached storage across the nodes in a cluster, the capacity available in a single machine is multiplied. This gives a very interesting amount of capacity without sacrificing performance significantly. By striping the data not only across multiple devices in one machine, but across the machines themselves, we have a solution that is resilient to the failure of any single component, including one or more of the machines themselves. By pulling the storage into the servers themselves, we can achieve significant cost savings, while the resiliency features of Storage Spaces Direct make this an extremely reliable platform. The storage may also be arranged in performance tiers, with bulk data residing in less expensive SATA drives, and data with stringent performance needs residing on SSD or NVMe storage where the performance shines. If you’re attending Ignite, come visit us in session BRK3187 on Tuesday, September 27, 2016 11:30 am – 12:15 pm. Read more about Storage Spaces Direct on the Windows Storage Team blog. 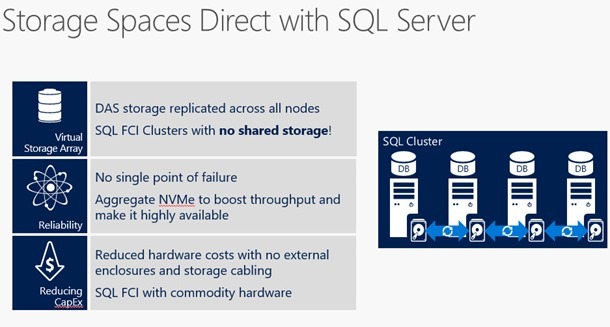 Get an overview of Storage Spaces Direct on TechNet.